"Pricing models for OSS systems have remained largely unchanged for decades, but changes in the industry will force pricing models to evolve." Pricing models for OSS systems have remained largely unchanged for decades but have become increasingly complex. However, changes in the industry will force vendors to look closely at their pricing models. 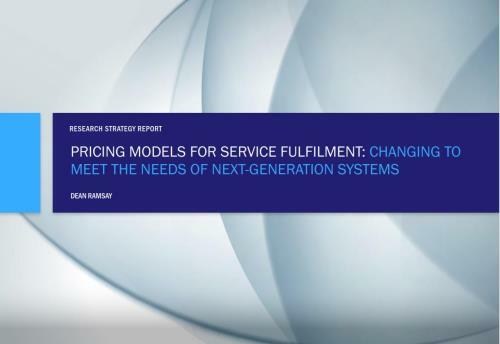 This report analyses the way that software vendors price service fulfilment systems and how the ways in which that software is delivered to the customer affects that pricing mechanism. The report also provides recommendations for service fulfilment system vendors that are evolving their solution sets to prepare for the introduction of virtualised networks. - Interviews with communications service providers (CSPs). - an examination of whether communications service providers (CSPs) are starting to prefer SaaS-based delivery of fulfilment systems. - What are the pricing and delivery models in use for the licensing of service fulfilment software systems? - Are the current methods ready to cope with the move to hybrid virtual/legacy networking? - What are the best practices for pricing in the industry? - What are the industry trends in alternative delivery models in service fulfilment? - Are CSPs starting to prefer SaaS-based delivery of fulfilment systems? - Service fulfilment system vendors that are updating their solutions to prepare for virtual next-generation (vNGN) technologies. - Vendors that are adapting their portfolios to provide their CSP clients with a SaaS-based solution. - CSPs that are exploring new service-led relationships with their software vendor partners.